Vegan Honey In 15 Minutes Using Only Two Ingredients! A few months ago we wrote an article about honey and the discussion on whether it is vegan or not. We did not take a side, we only presented two well thought out articles from two of the most respected people in the vegan movement. If you missed that debate you can read it here. Today I was reading private messages on the Facebook page when I saw one that piqued my interest. A fan of our page named Carolyn said she had a simple vegan honey recipe that was the perfect substitute for honey. When she said you only needed two ingredients I was really intrigued. Of course that was a claim I had to investigate immediately. Turns out she was right! 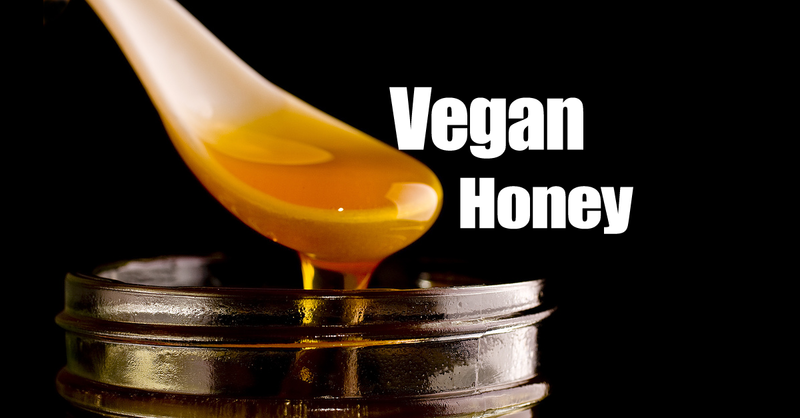 You really can make a simple vegan honey substitute and it’s easier than you might imagine. You only need 15 minutes and two ingredients. Get this simple recipe on the next page! So this accomplishes the goal of not being an animal product… but sugar from coconuts or dates is just as unhealthy as sugar from sugar cane, beets, corn, etc. Right? Isn’t one of the goals of eating vegan to eat healthier? the goal of being vegan is to not hurt, use or abuse animals. Healthy may or may not be a by-product but it is not the end point. Nope, it’s about not exploiting animals! Veganism, as coined by Donald Watson (considered the pioneer of “modern veganism”) is only about not purposely causing harm to animals. Most people associate that with only eating animals, but it goes into not wearing their skin, not using them for testing/entertainment and not using products made in whole or part from animals. Jay, the first priority of being vegan is do the least harm possible and to stop exploiting animals for personal gain. Good health is really a bonus. However, you don’t need to feel natural sugar from fruits – these sugars fuel us and energize us! Dr Mcdougall explains how even plain white sugar can help cure diabetes, and Freelee the banana girl and durian rider on YouTube eat coconut sugar and dates like there’s no tomorrow (and they have fantastic energy/health/test results). It’s not the sugar, it’s the fat that makes you fat. For goodness sake, just because we are vegan it dosent mean we are total heath nazis who never enjoy a lil sweet treat now and then! Vegan is for the animals, ok? No. It’s about not exploiting animals. Your health is your own – protect or destroy it as you wish – but don’t harm other sentient beings. Sounds good but dont you lose the health benefits of real honey? Im a Beegan so im good. I understand their are different schools of thought on honey. I would only point out that you will not get the health benefits of Raw organic honey with this. Well done, queen of the obvious. What about the benefits of honey? Do we get those same benefits from this? To everyone asking about the benefits of honey, the answer is it doesn’t matter. Honey is an animal product, the vomit of bees that are meant to keep a hive alive and healthy. Honey in NOT vegan.